Hey Guys,finally I am here with the second part of the awaited story. Thanks for your patience and here it goes!!! While bidding goodbye to him and his family ,some strange and strong feelings were hovering my mind .I felt like my soul preached before me and said that I’m seeing him for the last time,its a final good bye. This question made me think,think hard I thought about it deeply that my inner self got confused. Maybe Yes Or No ,I learnt from this encounter that the persons ,things ,deeds and favourable and unfavorable circumstances are the reflection of our Karma.Dhruv came in my life with a hope ,desire and inspiration.He came to fulfill a purpose for me . My family was also pleased to meet him and as he has earlier told us that he was hailing to Bangalore for training next month. Afterwards ,he didn’t reply to my texts and I felt it’s alright as he was busy in his hectic schedule preparing for the training exams .I found it a little embarrassing for me to ask him about his decision .I was pressurised by my parents to ask him through texting .After lots of excuses (phew),I decided to text him on whatsapp ,and to my utter surprise he replied within a minute .In a very decent manner ,he exclaimed that he was confused and need some time to think upon as it’s a life long decision .I admired his kindness and we waited for a month .Often I saw him online ,but never pinged him .Although we have talked once or twice through text , he wished me on festives before ,yet he made me more confused by his talks .I’m a straight forward person and I expected same from him .I put all efforts to understand him ,but It all went in vain. After a long gap ,of about a month my mother decided to called his mother (as we had other people to consider and could not sit ideal waiting for their response for too long )and asked directly about his decision .His mother repeated his son words and said,”He was still confused and also said that we can move on……….🤔. My parents were astonished as earlier they were very active in calling us and suddenly they gave a cold response. Here the story ends .It’s not necessary that story should end with a good note ,but the crucial point is What impact it lefts on your life! Anyway, when I think about that encounter it gives me immense positivity ,happiness as I would not have to go through the hassle of understanding that person ,there was a certain peace for me. Now I believe that never carry the burden of things that you are confused about. and also I would like to thank him for giving me a goal in my life as I was going through a bad phase of life .After completing my graduation I was preparing for the competitive exams for about an year .I put all perseverance efforts ,but all went in vain .Day by day I was loosing hope and suffering from depression .After meeting him and telling my inner feelings he convinced me to apply for a private job as it will provide not only happiness but the good ,vibrant ambiance.I will cherish in the company of people and imbibe many things from them and also it will give me my own identity. His words left a great impression on me and I applied for a job .After cracking the interview ,I got the job and now I’m really happy and thankful to him. All credit goes to him who not only endure positivity in me ,but also changed my outlook towards life😆 . Destiny has unleashed its path for me .After that ,We never met again.He played his role very well and ignite desire to dream high and think positive. He is not my Soulmate definately but put a great impact on my soul .He is the reflection of my innerself who triggered me to draw out the best out of me and lead a peaceful life. Here my story ends leaving a lasting memory . We are so much obsessed with happy endings that i was looking for one in this part after reading the first one. The twist and message left me spellbound. 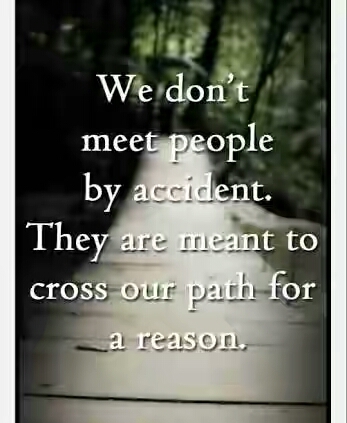 Yeah ,I can understand as We are expecting the same thing ,but later I was proved wrong .Sometimes we fail to see what is right or wrong for us ,but then God help us .My intutions has told me he is not one ,but I realised later .Still h e played a great part in my life bcoz God has sent him. Thanku so much .I want to read your posts ,but everyone when I visit on your site ,it shows that the member has deleted it. Ohh ,sorry I have tried again .Now it has been shown . Great challenges make life interesting; overcoming them makes life meaningful. Don’t wait until everything is just right; it will never be perfect….nice experience u had..
got positive approach towards life after read ur story.. Thank u so much for your inspiring comment .I felt same after this experience . An experience meant to be in order to make you stronger. I like your positive attitude. So I was right when I said you write the other half. I have not read your previous half. These are stories of Life for Life to know. Yes,these are the real story ,a real experience .